As we know, the PS4 Pro offers 4K resolution, better visuals, and potentially higher frame rates. Some already-released games will feature PS4 Pro support through updates, while others will come with enhancements out of the box. The list of PS4 Pro games is growing, as 2K Games recently announced that NBA 2K17 will support native 4K on the platform. There are more games players will be able to play on Sony’s upcoming console. Besides NBA 2K17, there will be more native 4K games including The Last Of Us Remastered, The Elder Scroll Online, Hustle Kings, Rez Infinite and more. In a recent update from 2K Games, the company confirmed that NBA 2K17 will support native 4K resolution and will run on PS4 Pro. The company assured fans, saying that the updates are coming which include 4K and HDR support that will help the players achieve 60fps gameplay experience. 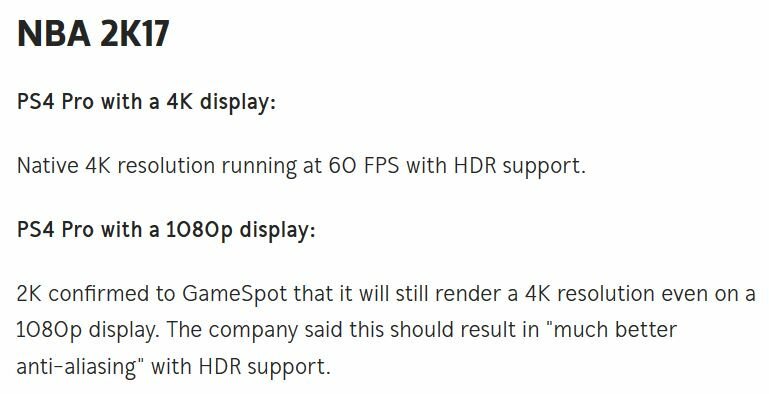 2K Games has confirmed that NBA 2K17 will support 4K resolution even on 1080p display, and it will deliver “much better anti-aliasing” with HDR. There are many games fans want to see on PS4 Pro. As the console will support 4K with HDR, there are some games fans can enjoy on this console. Apart from the abovementioned PS4 Pro games, there are many more titles that have been confirmed by their respective developers and publishers. These games include Fallout 4, SMITE, Wheels of Aurelia, Forma 8, Futuridium EP Deluxe, and Thumper. Some of the newly launched and upcoming games such as Deus Ex: Mankind Divided, The Elder Scrolls V: Skyrim Special Edition Edition, Paragon, and The Witness will also get update patches for PS4 Pro 4K support. As many games are coming on the console, Destiny and The Witcher 3 developers have confirmed that they currently have no plans to add 4K support for the titles. Players should note that some of the games will not give you more than 30fps performance, while there are titles that will be capable of keeping consistent 60fps performance on PS4 Pro. Sony’s upcoming 4k console will be available on November 10 at the price of US$399. The PS4 Pro can enable games to display at 4K resolution, utilize extra graphical effects, and run at smoother frame rates. Additionally, games can benefit whether they're played on 4K or 1080p displays. That is to say that gamers can enjoy better visuals, and higher frame rates with the console of NBA 2K17 which support 4K. According to reports, the VC points can be used to get new wearable gear on the court or to upgrade the player's attributes. The in-game currency MT can help gamers to arrange the necessary things to personalize the players and teams. Meanwhile, as every NBA 2K17 player knows, the game's Virtual Currency is quite difficult to achieve if one has no idea how to get it. Although a number of ways have been revealed to earn them some VC points, U4NBA is reported to have ways that help players get VC points. Otherwise, gamers can choose buy NBA 2K17 MT & VC at professional online gaming house like U4NBA.COM, and we provide the most affordable cost.